A Quilting Sheep: Wake Up to Kona Solids!! Also, a heartfelt thank you to the sponsors of this hop, Amanda Murphy, Robert Kaufman and Aurifil. I decided to jump in with both feet and go all out with this one and mass produce half square triangles using the tutorial by Carole @ Quilting Adventures A total of 44 2 ½" strips (3 colors from my stash of Kona I had that were not included in the jelly roll) were paired with 2 ½" strips of Kona snow. Again, the riot of color was so pretty, I had to take more pictures. Trust me, I have tons more pictures, but I restrained myself from showing them all. How many half square triangles do you see?? 784! I can't remember now how many I had made in total. The quilt measures 64 ½" x 64 ½". A nice lap size for cuddling with. And the back...All in Kona solids with 4 orphan blocks. With the leftover half square triangles, I made a quilted pillow cover using Lynne's tutorial. It is my favorite way to make pillow covers. Have a happy Thursday, everyone!! 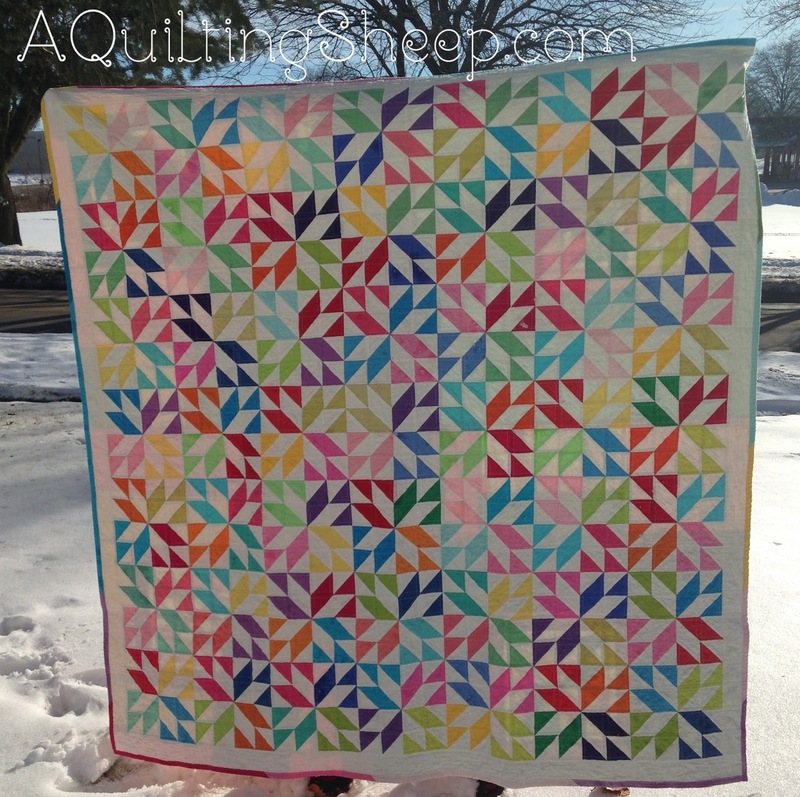 Beautiful quilt made of HSTs! And I love the pieced back! It is amazing to see what you can do with all the leftovers. Stunning, just stunning! Love your pillow too. Thank you for sharing. 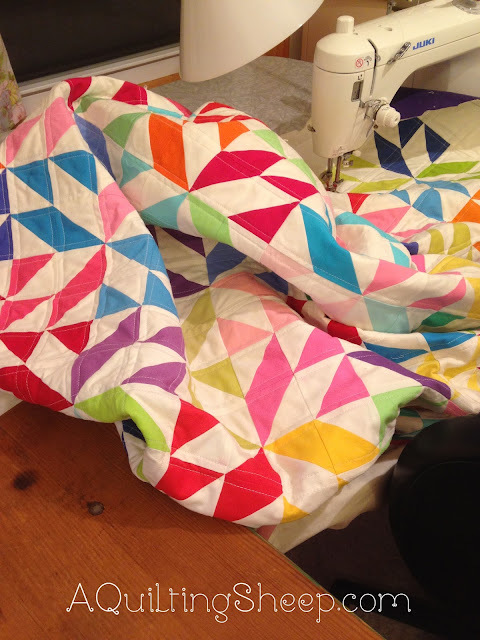 HST's are the best - they can be put in any configuration ad your quilt is STUNNING!!!!! Hi Amy! Your quilt is stunningly gorgeous. 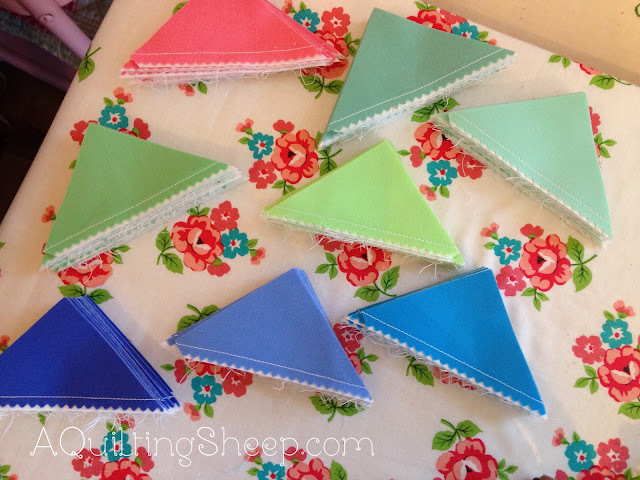 The perfect use of color arrangement and HSTs! Great job! I don't know if I like the back or the front better. They are both awesome! The pillow is a very sweet addition. Are you giving it away or keeping? Keep up the great job! You have it today for the WOW factor! Amy, this is beautiful! I love how it turned out and the colors are great. How fun your hubby helped out. Love the quilting too. Very inspiring. Oh this is Mine, diese Farben und die Formen einfach schön. Wonderful colors and a very beautiful quilt. The back is awesome. Thanks for sharing your creativity and being part of this hop. Amy, it's incredible what beautiful quilts we can make with this simple shape: half square triangle. I love it! And the pillow is such a nice addition. Gorgeous! I have to say I love the back the most. Eye candy everywhere...I love this quilt and the graphic pillow! Thanks so much for the inspiration! Wonderful!! I love the pattern and the colors are just too beautiful. You did an excellent job on the quilt and pillow!! 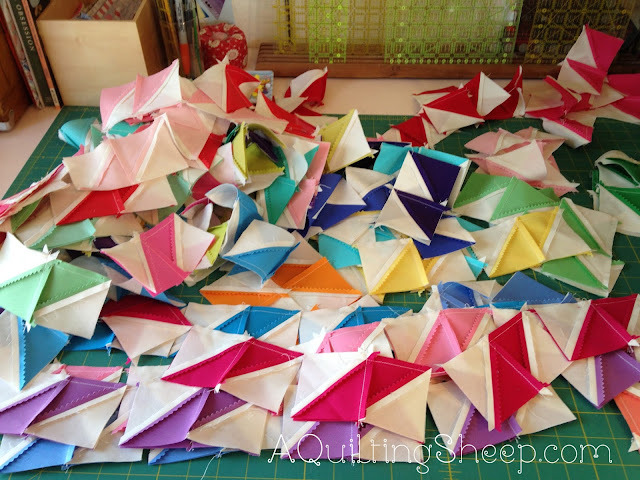 Oh I just love that huge pile of HSTs!! 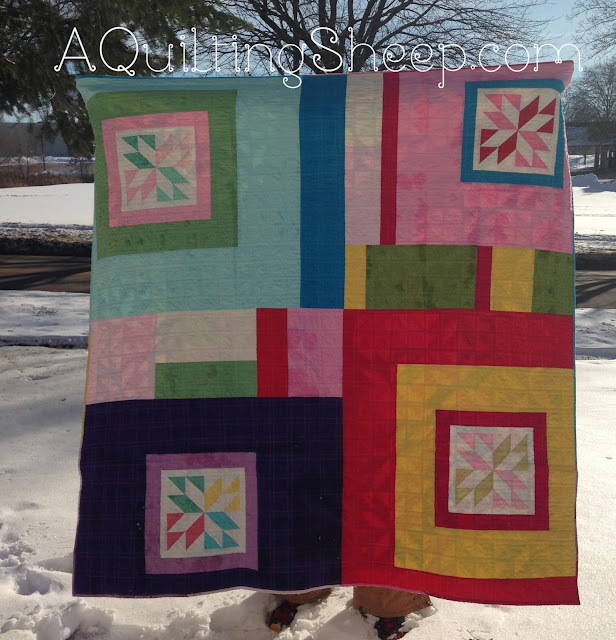 That is one ambitious quilt full of color goodness - with a back that is just a sweet. Loved seeing your process. And those pictures are awesome! What a wonderful quilt - so big. Who knew that a jelly roll could make something that big with just the white added? Thanks for sharing today. I know that making that quilt made you happy! Wow. Love your quilt and pillow. Very eyecatching! 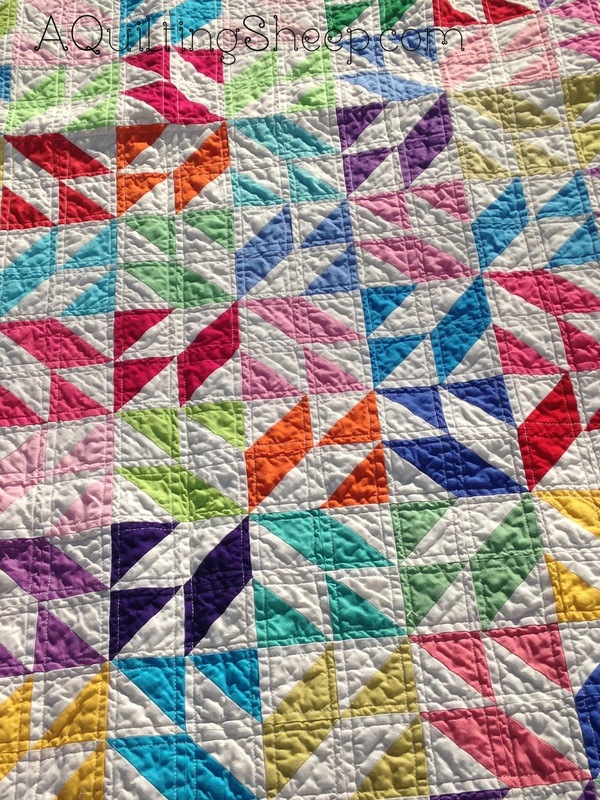 Your quilt is so beautiful - thanks for sharing & thanks for the link for HSTs. Your quilt is stunning, amazing, impressive...front and back! And I love your pillow too! Seeing you in your happy place makes me happy…look at these stunning quilts…fabulous, you just continue to shine…. WOW! Simply gorgeous quilt and that back is inspiring. So pretty. It still amazes me that such a great quilt design can be achieved by just simple HST's. Love it! Thank you for showing off such a great quilt and pillow. How perfectly delightful, and oh, my, such work involved! Thanks for sharing your work in progress shots. And especially the link to making the half square triangles from strips. What a clever method! Your quilt is quite a work of art. All those hst's!!! You do fine work! WOW, that is gorgeous. I could never, ever make that many hst's. I absolutely hate trimming them up! LOL. Love your pillow too. Seeing that massive stack of HST's made me want to hyperventilate. There are so many! You put them all together to make a totally stunning and beautiful quilt and pillow...love them! The back of the quilt is amazing, too. Great projects! Your quilt is exquisit,of course all of your Kona projects are beautiful! I have been wanting tl give that tutorial a go,thanks for sharing your project from it. Wow!! Your quilt is gorgeous! 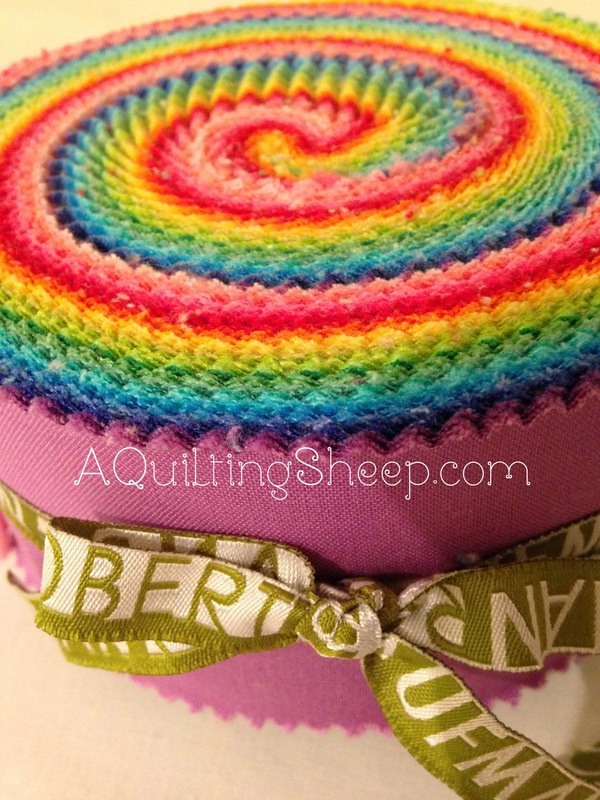 I love the colors in that jelly roll. 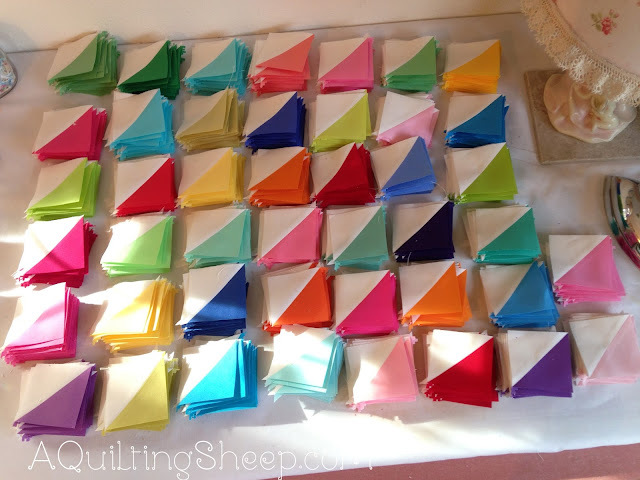 I would love to make a quilt with all solids. I must put that on my to-do list soon. Your projects are wonderful as always! Thaks for sharing with us. Wow, they are all so gorgeous! That is a LOT of triangles!! Beautiful work! I could do a "leap for joy" with your Quilted Sheep today! LOVE IT! !....you always inspire me!! Rock On!!! You made hst shine. I really like your pattern and your pillow is love at first sight. It is so nice to have a partner to bounce ideas off of. Congratulations on you top 2 pick of the day. Well deserved. Oh my goodness! This entire quilt is fabulous both front and back. I think it's one of my favorites that I've seen in the hop so far. Good thing you mass produced all those lovely HSTs because you sure used lots of them. Ok, I'm going to pin this to my Pinterest board for future inspiration. You sqouze a lot out of that jelly roll ! I love the back as much as the front ! Another quilter with active husband support! I like the final design very much. Who would have thought all those colors could look so unified?I like to see that so many blog stops also feature what they did with the "left-overs". YOUR left-overs are LOVELY! Oh Amy, that is stunning. All triangles! Wow! I just love it. Beautiful! Spectacular! Love all those HST. The pillow is gorgeous too! Love them both and Gratz on being top two!! I love your quilt - so wonderful! I enjoyed seeing the photos of the construction and that your hubby helped with the block placement. Great job! Loved your quilts! Beautiful placement of the colors. I should hope to become so talented! I'm not a major piecer so this would have been challenging for me! You did it justice! Wow! such beautiful projects. i just love all of those colors. This is stunning! The different patterns that can be made with hst is amazing. Beautiful, beautiful work! Very pretty quilt and pillow. Wow a riot of beautiful colour what fun that must have been! I really loved it, thanks for sharing. Beautiful quilt and pillow! Now it's a need to try the tutorial you used for the half square triangles. It looks like it worked really well. The colors are so happy and there are many designs to see in your quilt, especially after the quilting. Wow! Wonderful Kona quilt, Amy. Amazed at all the HSTs it took to make this - well worth your effort though. It's beautiful, front and back! Great pillow, too. Thanks for sharing and inspiring us today. Oh My Goodness...all those little bits of Kona solid fabrics would make me crazy however you have created a stunning quilt and pillow. WOW! From me everything is beautiful! Love, love, love the quilt design! Perfect job! Congratulations for the big WOW! This is an amazing quilt. 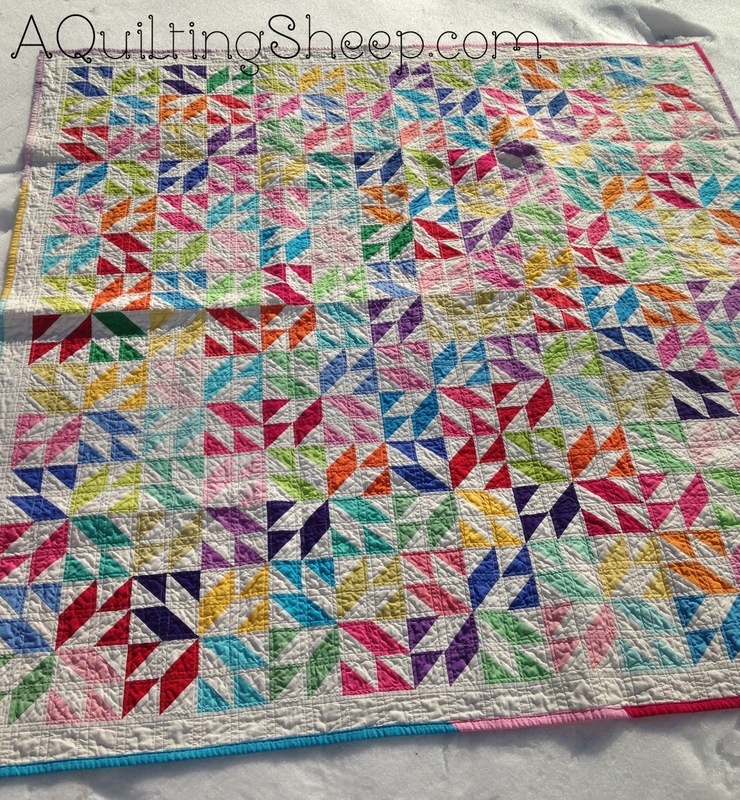 I really like the design, colors and the quilting is fabulous. When I saw the picture of the back, I thought you had made a second quilt until I read that it was the backing. It is the nicest pieced backing I have ever seen. My goodness Amy you have been so busy!! This method is amazing and looks pretty easy too...your quilt is just lovely and the back too!! also really like your new wall quilt for your sewing room door. That is a beautiful quilt Amy. So bright and cheery. Beautiful projects and I especially love how you put the central point of the pillow a little off center - so dynamic! Love love love your quilt and pillow. Just gorgeous!!!! Lovely quilt. Thanks for sharing. What a happy quilt! I like it a lot, and thank you very much for linking that pillow tutorial, I needed that for the 5 or so piles of scrap waiting to become a pillow, or in this case, a pillow cover. Have a wonderful day! Stunning quilt and the back too! The pillow it beautiful. I have really enjoyed the blog hop. Thanks for participating and inspiring us! This is incredible. 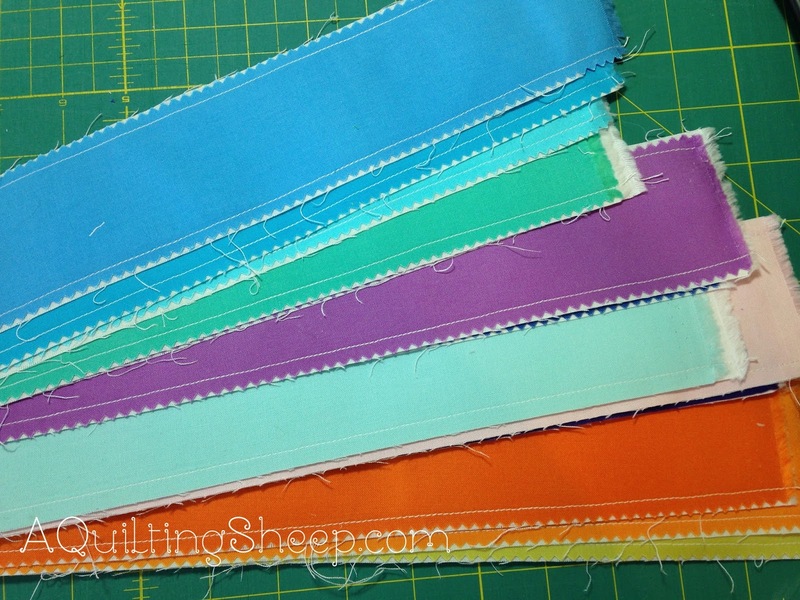 The design is gorgeous and I LOVE that trick for making HSTs. I'm going to have to go and pin that. That is just too cute! Great job, fun colors, bright and cheery! You must be dreaming about triangles by now. What a gorgeous quilt!!! Now that was a LOT of hst's! Beautiful quilt. Love it. I love the pic of all the hst's ironed and in little stacks on the table. Looks like candy. Yum! a perfect piece of work! love all those triangles ... kona jewels! Wow, thats a lot of HST's! You did some great work with them too:) Beautiful quilts and the pillow too. So very lovely! I make have to try that one myself! pbstrand@msn.com aka Beth @ Words & Stitches who just finished her Kona project today! What a terrific quilt and a lot of HST's. I agree with you, it's so fun when my husband takes interest in my obsession. I like the sewing themed quilt in your previous blog. That's a great quilt too. Love your quilt both coming and going. great picture of the hundreds of HST's. But my favorite is the pillow. Great work. Ohhh, how pretty! Those half-square triangles are so versatile. Sometimes (like now) it's hard to realize the pattern developed is made from all HST. Totally gorgeous and so is the pillow. Wow, that's a lot of triangles! Your quilt is fabulous! Love the pillow too. Thanks for sharing the tutorial. I love the bright Kona jelly roll. A girl after my own heart. Fabulous project! Your quilt is really a reversible quilt. I can not decide which side I like the best. The colours are eye candy no matter how you look at it. I also really like your pillow. 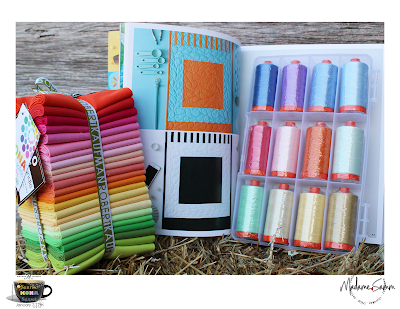 Thanks for sharing your projects and the strip HST tutorial link. I will have to try this. Wow! your projects are just amazing! Backs side of your quilt is my most favorite. Because its so unique. Love it! Wow, amazing!! Love that pillow!! Lovely pattern, I could look at it all day and see 100 different things in it. Beautiful quilt....I like the way you did your backing. Its something how all those HST's made such a beautiful quilt. The back of your quilt is as beautiful as the front! I love seeing the back of quilts, I get so excited when people share the backing! Love the pillow too! Fabulous quilt and pillow! Love the bright Kona colors you used. I'm in love with bright colors. I really like the traditional and less traditional ways you've used the brights. Yum. What a gorgeous quilt!! Even the back is beautiful enough to be a "Front" too!! Awesome!! the Pillow is a perfect touch too!! GRRRRRRREAT job!!! Your quilt is just awesome! I love all of the HST and the method you used to make them. Love the colors. Such a pretty rainbow of stars. You have the patience of Job! All those 2.5" HSTs. I'd be bonkers. Isn't it wonderful to have a spouse who supports your habit. My second husband adored by quilting habit. Unfortunately for me, fortunately for him, he's in heaven now. He had a great eye color, too. One of the things I love about the hop is learning new techinques. I'm in charge of education for my guild this year. It's just a 5-10 minute spot each month. I love the tube method of making HSTs. I plan to talk about seam pressing next month. Then I may have a guest in March as I may be being grandma that month. So this may be the topic for April. I'm in awe of your quilt. It is the epitome of Kona solid. Thanks for participating and being an great inspiration not only for Kona solids but also for patience and great quilting and spousal support. Absolutely stunning! 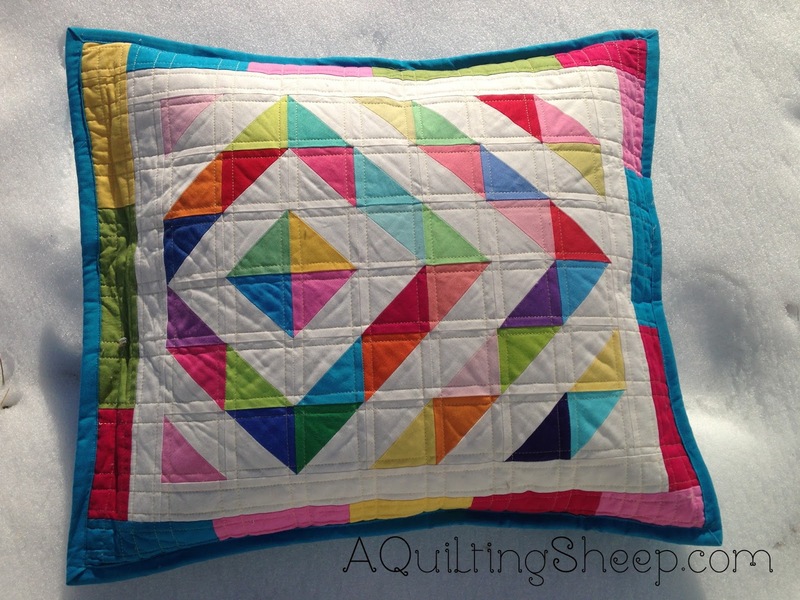 I love the quilting - and the pillow! Wonderful! Another beautiful quilt, but I have to say that's one is a genuine 2-fer deal! The back is a great pieced work in itself, looks very modern! Great job! OH MY GOODNESS!! 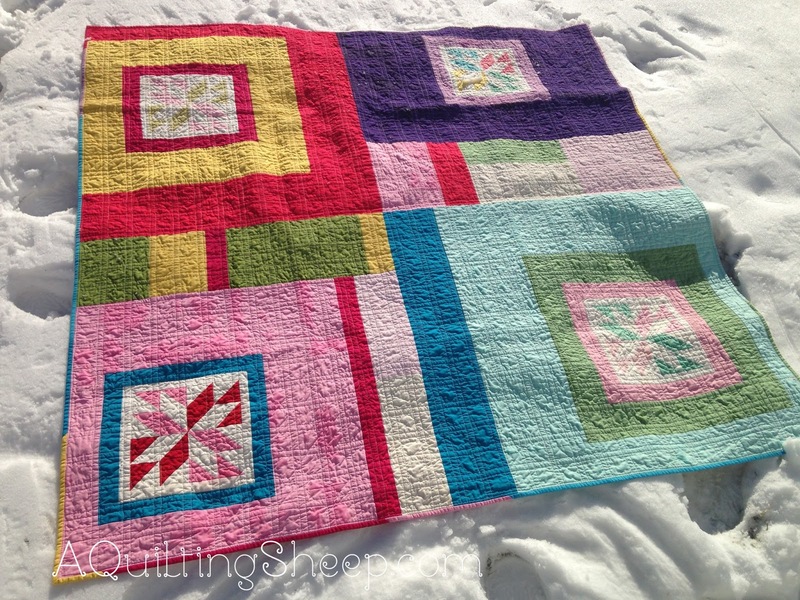 Your quilt is a real show stopper! Simply gorgeous. This just fantastic! I have never copied a quilt before but I may have to with this one! That matching pillow from scraps is awesome! Thank you for posting this! I came across this on pinterest. Love the quilt. and I can't wait to make mass HSTs your way. Sounds so much easier!!!! Yay!!!!!! So lovely! And what a smart way to do the HSTs, I can't wait to try that method out. Lovely quilt! Thank you for mentioning my blog for the HST tutorial! It's my favourite method! So simple and so quick! Thank you again! Cheers! I love this quilt: so colourful it makes me happy! Love this quilt and want to make it for my sister for graduation! 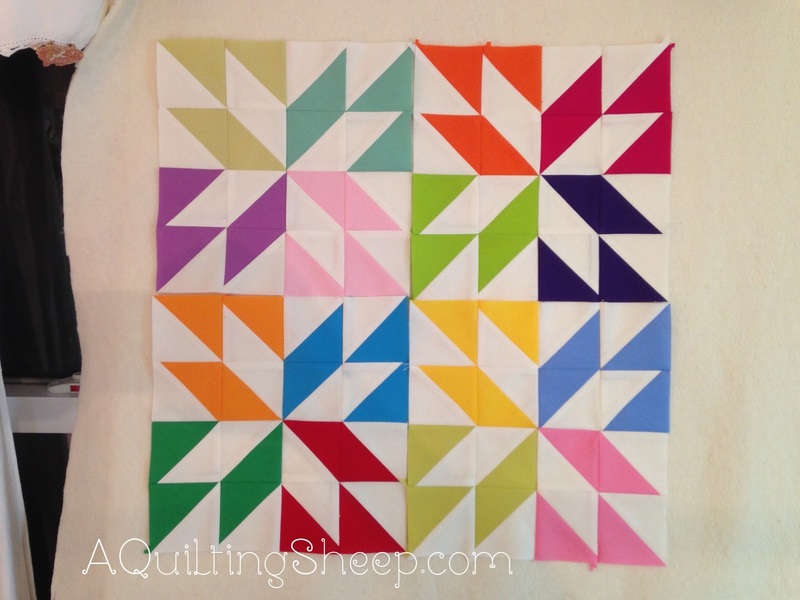 I am thinking about making my HST with the tutorial you linked to in your post, but after talking to the ladies at my local quilt store I was discouraged from using that method because of the bias being all along the cut edge. 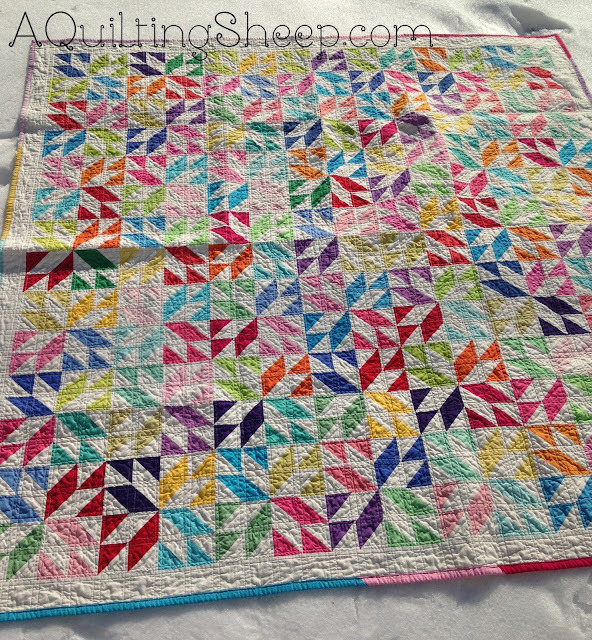 My question for you is: When you were putting this quilt together, did you have any trouble lining up your blocks and making things square because of that stretch?? I'm a new quilter so any tips would be appreciated :) Thanks! This is so gorgeous! I have lots of Kona leftovers from my Postcard from Sweden Quilt--I may have to put them to use making this. Thank you for sharing your pattern. So many HST's! What a beautiful beautiful quilt! The colors are just stunning!